So in about 2 months I will be in basic training for the army. Right now I can run 1 mile in 13 minutes and have never been good at running actually I'm horrible. I need to be able to run the 2 mile run part of the test in 18 minutes. I have been really trying; even quit smoking cigs a while back hoping that will help. It is like my lungs get tired before my muscles even start feeling anything. It is very difficult to run the whole mile which is very frustrating so I started doing interval training which hasn't helped and I tried running on a treadmill at an incline which with a treadmill I can run for the whole mile and sometimes more but outside my lungs start burning and I get very light headed. Is there any advise to improve in these last two months? Thank you for your question about the 2 mile run. Yes, there are some things I can help you with. You are quite a bit removed from your goal at the moment, so it will be interesting to see how much improvement you'll make over the next two months. If you are not already doing this, make sure you run 3-4 times per week and complement this with cross-training, e.g. cycling, swimming etc. The biggest focus should be on increasing your endurance, this can be done via any aerobic exercise, not just running. Just running 3 x per week is not enough, use cross-training as well to still exercise while you give your running muscles a break. With the running, you'll need to first be able to comfortably cover that distance of 2 miles. The best way to approach this is via run/walks. It's okay if in the beginning you can't run the whole distance yet. Just focus on getting out there for 30 minutes no less and alternate running and walking. Every 2nd workout, increase the time spent running and decrease the time spent walking. 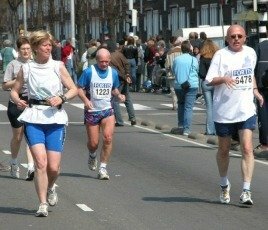 More about run/walks can be found in the beginner running tips section. Keep this run/walk and cross-training approach going for four weeks. Then after that replace some of the run/walks with more strenuous running workouts like intervals and fartlek training. You could also include some time trials, i.e. 2-mile timed efforts to see how close you are getting to your goal. If in need of further and more precise directions, I can refer you to my coaching service which can be useful for important goals that involve your career. Best of luck. I hope you make it to your goal.